Insurance executive Umberto Fedeli dabbed his sweating forehead under June's evening sun in Gates Mills, the wooded watershed suburb on Cuyahoga County's deep-eastern flank. 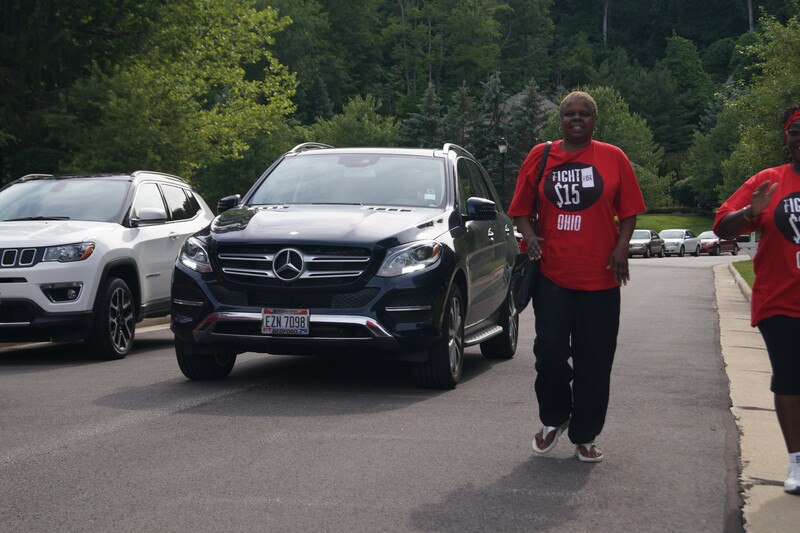 The first of the evening's 15 Mercedes-Benzes was being valeted up Village Trail, the hilly sidewalk-less street off Wilson Mills Road that terminates in a cul-de-sac where Fedeli has built his big Italianate home on three adjacent lots. The blue-suited Fedeli cast a side eye at the gathering protesters from the Cuyahoga County Progressive Caucus, who were being monitored by the soft-spoken Police Chief Gregg Minichello and a handful of Gates Mills' finest, donned in bulletproof vests. A German Shepherd Dog, an official K-9, was visible on Fedeli's property. In a nearby driveway sat a vehicle from Tenable Protective Services, the preferred local security firm for private events. Members of the Cuyahoga County Progressive Caucus (CCPC), the local Bernie Sanders campaign group that has morphed and grown into a regional political activist network, flipped through the signs they'd prepared. 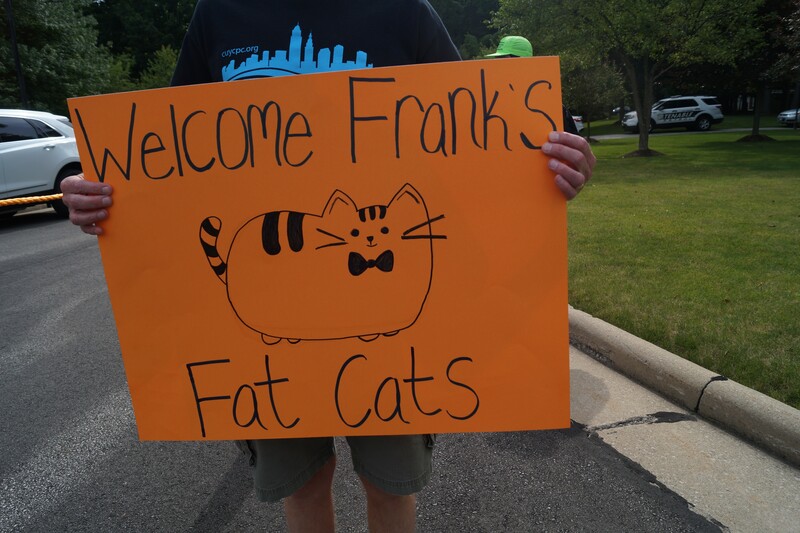 They were calling this event "Frank's Fat Cat Festival." 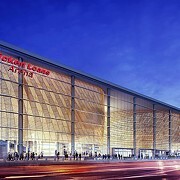 It had been somewhat hastily organized in the aftermath of a news item originally published by Cleveland.com's Mark Naymik. 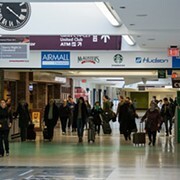 Three area businessmen — Fedeli himself and the black construction magnates Lonnie Coleman and Dominic Ozanne — had sent a letter to high-profile leaders in the business community inviting them to attend the fundraiser and asking for their (financial) support of the incumbent Jackson, who is seeking an unprecedented fourth term. "[Jackson] has capably and fearlessly taken on many crises head on, providing the sure and steady leadership that has enabled our city to remain stable," the letter read. "He continues to be the leader that Cleveland needs to maintain the positive momentum created by the public and private sectors working cooperatively." 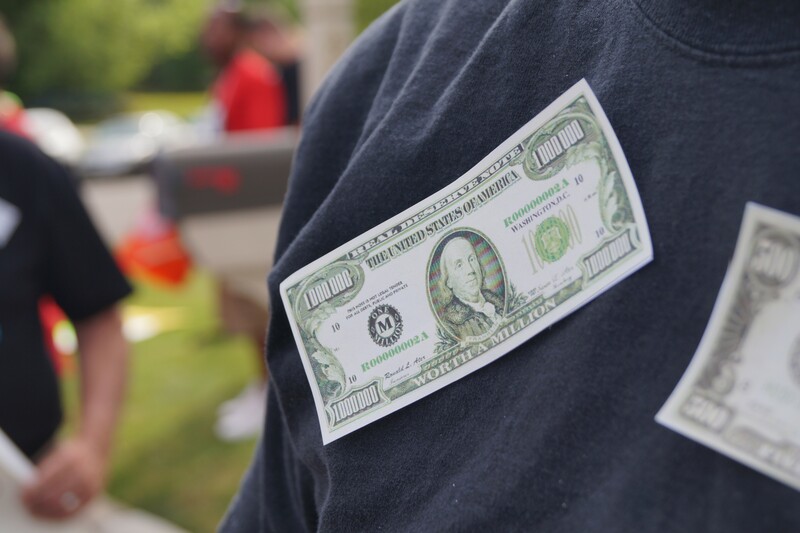 The letter reminded potential attendees that the maximum contribution — thanks to a change in legislation authored by Cleveland City Council last year — is now $5,000 for an individual and $7,500 for a PAC. The symbolism of the event was too rich for opponents to pass up: Jackson's primary vulnerability is the perception that he caters to "downtown interests" at the expense of Cleveland neighborhoods. One would expect that Jackson and his campaign would work assiduously to avoid playing into that narrative. And yet here he was scheduled to be, gladhanding with wealthy executives far away from the city. 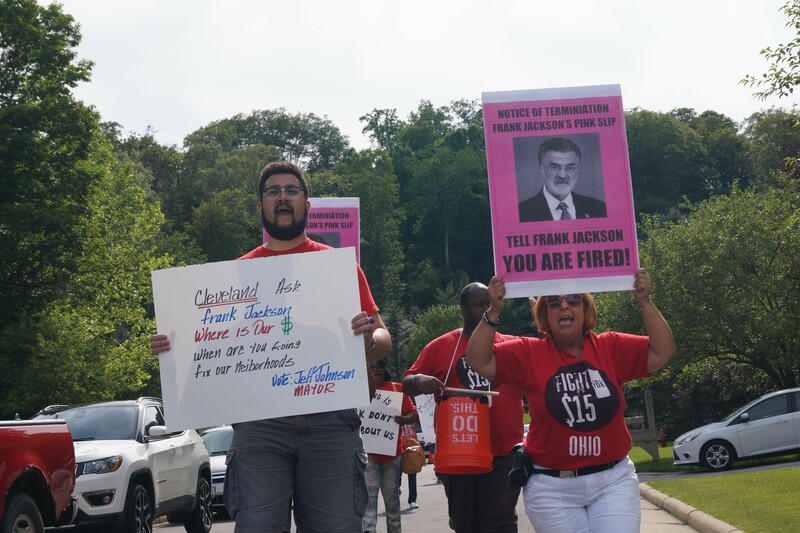 The Progressive Caucus teamed up with SEIU, the union that led the minimum wage battle in Cleveland (and which has endorsed Jeff Johnson for Mayor). 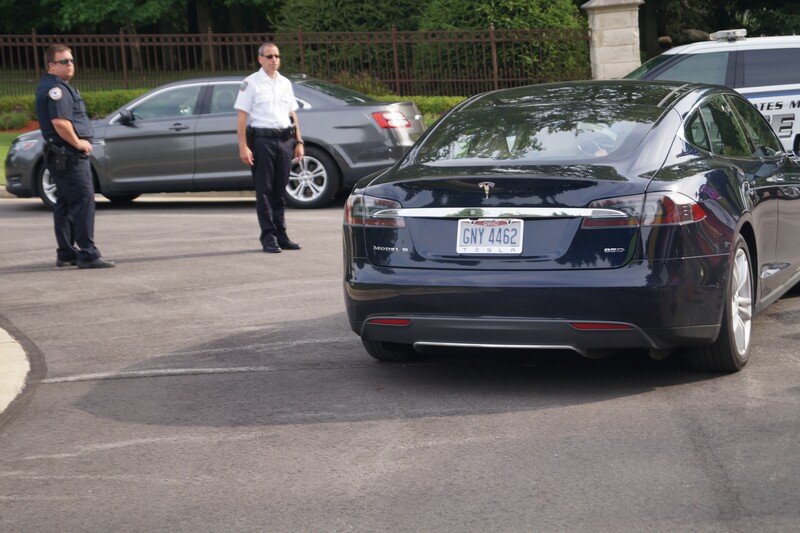 They planned to carpool to Gates Mills and chant at the attendees as they arrived in their luxury vehicles. "I don't mind you being rich," read one sign. "I mind you buying our government!" Randy Cunningham, a longtime Cleveland Activist — in fact, local community organizing's chronicler — had dubbed the event "Hunt Club Two" in a conversation at CCPC headquarters in Lakewood that afternoon. It was a reference to an action in 1982, when 600 local activists descended in buses upon the Chagrin Valley Hunt Club (also in Gates Mills) to confront SOHIO President Alton Whitehouse. It was an action that so rattled Cleveland's elites, Cunningham said, that it basically shattered community organizing for the next 30 years. 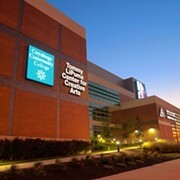 other action the groups had taken," Cunningham wrote in Chapter eight of Democratizing Cleveland. "Mike O’Brien of [Near West Neighbors in Action] explained that the hit had violated a norm more profound than the Constitution. 'You do not embarrass the rich among their rich peers.'" And yet that's precisely what the protesters did Wednesday night. Umberto Fedeli was agitated most of the evening. Though he twice offered pizza to the roughly 30 protesters in attendance, he seemed to view their presence as a kind of incursion, a flouting of dignity and decency. 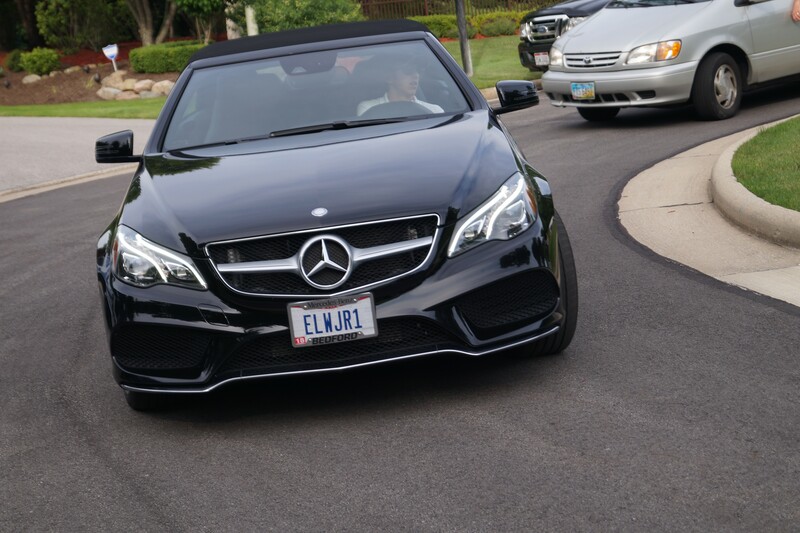 Several of the guests, as they exited their vehicles, looked with amusement or derision at the gathered crowd. 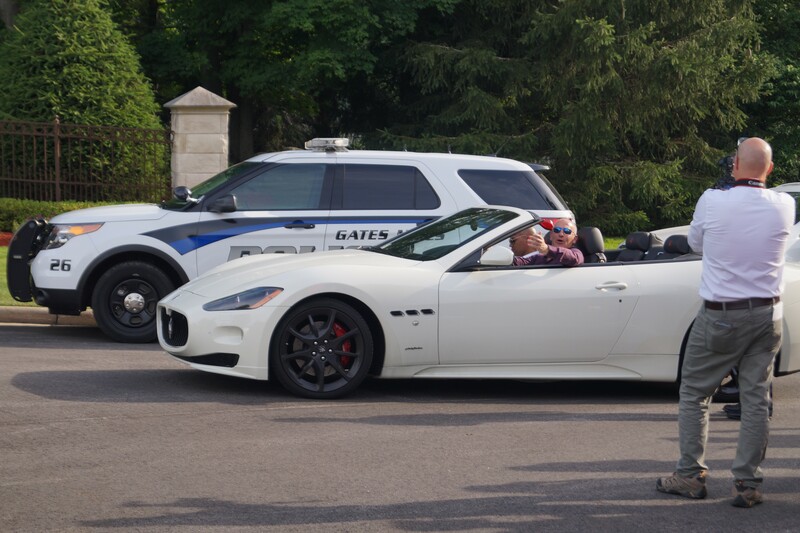 Developer Andrew Brickman, who arrived in the evening's only Maserati, engaged the protesters as he drove by: "I'm just working here," he said, before flashing a mocking thumbs up. 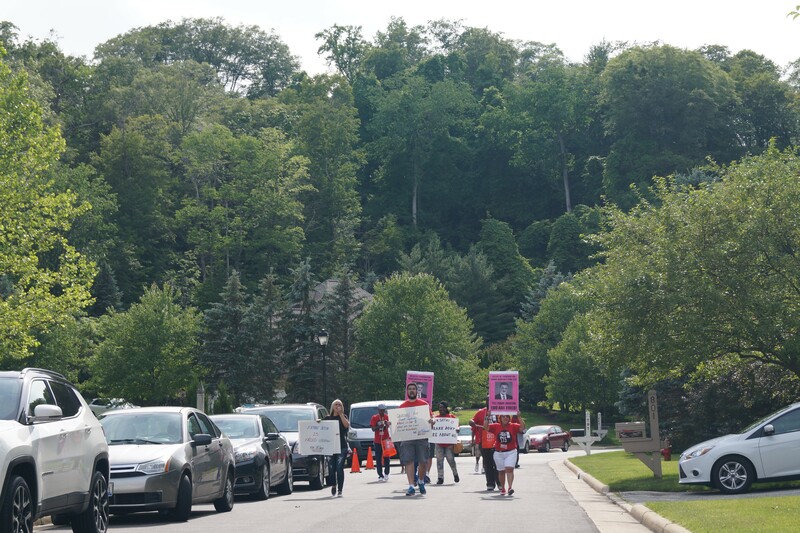 In coordination with Minichello and the Gates Mills police, the protesters were accorded a staging area on a lushly planted cul-de-sac across from the Fedeli driveway. The SEIU leaders kept the chants going virtually without pause: Hey hey, ho ho, Frank Jackson has got to go ... This is what Democracy looks like, that is what hypocrisy looks like '/ This is what Democracy looks like, that is what plutocracy looks like. 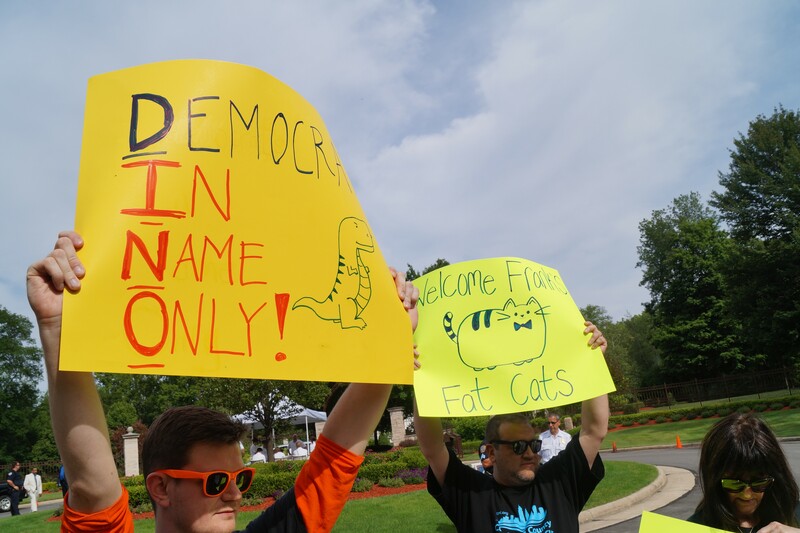 Periodically, protesters would meow at passing cars, in keeping with the 'Fat Cat' theme. The event was swift and modestly attended. Some guests came and went in less than an hour. (Despite Fedeli's famous hospitality, it was a Wednesday evening, and guests were there foremost to write checks. It was a fundraiser, after all). Some notable attendees: Bernie Kosar; Playhouse Square CEO Art Falco; Crain's 2017 Business Executive of the Year Fred DiSanto*; Former Northeast Ohio Media Group Publisher Andrea Hogben; developer Fred Geis; the luxury auto dealership kingpin Bernie Moreno; and Cleveland Clinic CEO Toby Cosgrove. *Correction: DiSanto was named Business Executive of the Year by the Sales and Marketing Executives of Cleveland (SME Cleveland), not Crain's. Not okay - but reality of mayor's race where managing perception is the issue. Naymik is right. Perception is key — he even suggested on Twitter that Jackson's supporters might have mailed in their checks to avoid the damaging publicity. Several of the chants — the meows, for instance, or the cries of "Let us in!" — emphasized the stark wealth gap between those attending the party and those protesting it, but the object of the demonstrators' anger was overwhelmingly Jackson himself, not the hosts or the guests. Jackson arrived in the passenger seat of a Ford sedan. 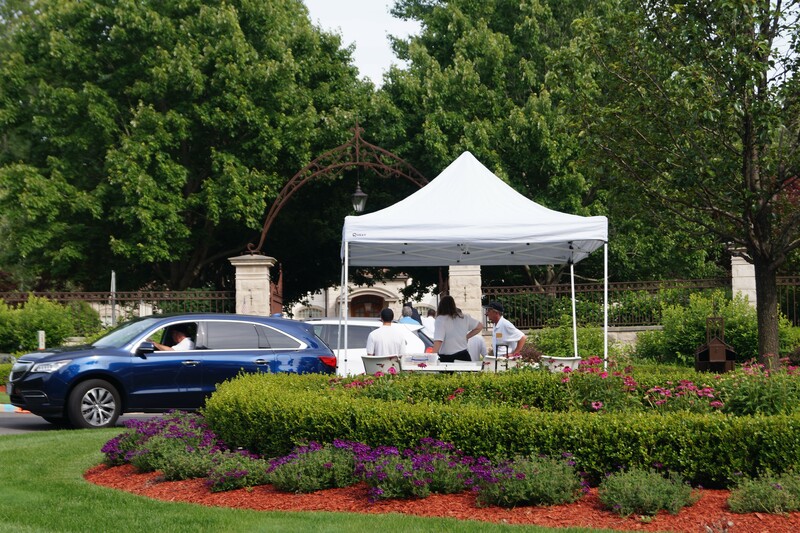 Unlike the rest of the vehicles, his turned off of the traffic circle and under an archway onto Fedeli's driveway. He exited the vehicle at a safe distance. Protesters could barely make him out. Jackson officially submitted his signatures Wednesday. But he did not attend a mayoral forum earlier this week where other serious challengers introduced themselves and answered questions in Ward 14, a low-income west-side ward with the city's densest Latino concentration (and historically bad voter turnout). Two nights later, he appeared in Gates Mills, at this exclusive high-dollar event attended by developers and lawyers and financial executives, folks for whom "sure and steady leadership" means leadership that honors and defers to corporate Cleveland's power and influence. 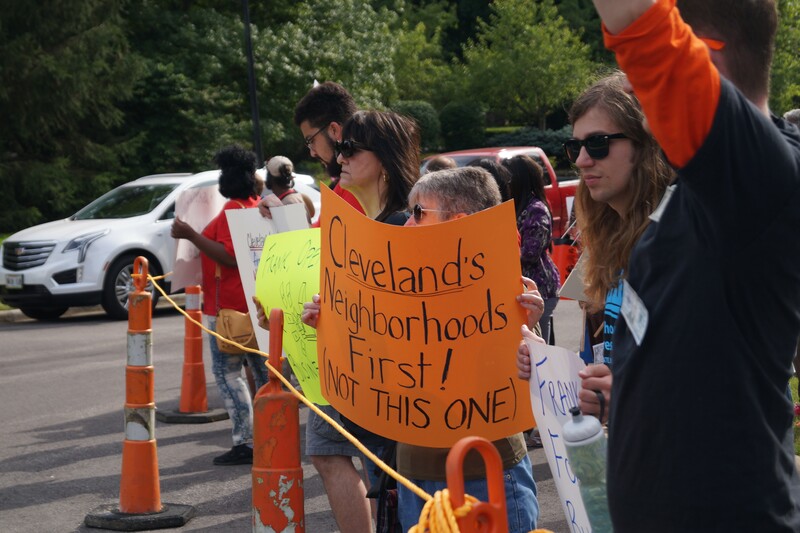 "Cleveland's Neighborhoods First!" advised one protester's sign. "(NOT THIS ONE.)"